Place 1 Tbsp. wafer crumbs in bottom of each of 8 (6- to 7-oz.) 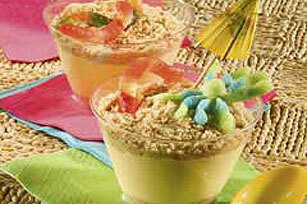 paper or plastic cups; cover with layers of pudding and remaining crumbs. Refrigerate 1 hour. Top with fruit snacks before serving. Place wafers in resealable plastic bag; crush with rolling pin. Or, process in food processor until finely crushed. Garnish desserts with octopus-shaped chewy fruit snacks in addition to the worm-shaped snacks. For creamier desserts, add 1 cup thawed COOL WHIP Whipped Topping to pudding mixture before spooning into cups.